A majority of state IT leaders expect their agencies to shift the bulk of their IT investment funds toward a combination of cloud computing models over the next three years, according to a new StateScoop survey. Seven in 10 state IT decision makers polled in the survey reported their agency will devote most of their IT investments toward a combination of cloud models — including government-only community clouds, commercial clouds or a hybrid approach — rather than on-site, government-run data centers over the next three years. That compares to 6 in 10 federal IT executives in a parallel survey, suggesting state agencies appear better able, or more inclined, to invest in cloud computing than their federal counterparts. The investment shift reflects greater readiness by state agencies to provision and automate cloud services for various enterprise applications. The study’s findings point to growing confidence that cloud computing offers the means to improve mission services despite lingering security concerns. These and other findings are highlighted in a new “State Cloud Readiness Report,” produced by StateScoop and sponsored by VMware, Intel and Carahsoft. The study, based on responses from 150 prequalified senior state government IT decision-makers, explores the progress of state agencies in adopting cloud computing for a variety of enterprise workloads. State IT leaders reported their agencies are making advances in cloud readiness for eight types of workloads — from email and website platforms to enterprise-level services and applications. 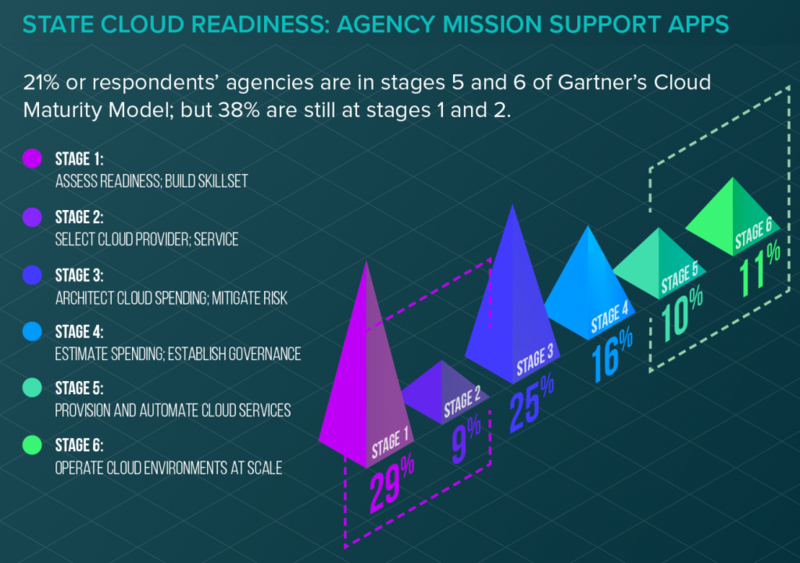 Two in 10 respondents said their agencies are now ready to “provision cloud services” or “operate cloud environments at scale” for mission support applications as well as for business applications such as financial management systems. About twice as many, however, are still at the preliminary assessment or selection stage of Gartner’s 6-stage cloud readiness scale. “The findings suggest an uneven playing field among state agencies for how quickly they can migrate essential applications and services to the cloud,” said Wyatt Kash, senior vice president at Scoop News Group. As state agencies gain familiarity with deploying cloud services, the motivations for migrating to the cloud have begun to shift. Looking at internal demands, state IT officials reported the need to enhance continuity of operations, analyze data and modernize systems are now the top drivers in their planning. External pressure to reduce total operating costs remains the leading motivation for agencies to consider adopting cloud computing, but pressure to improve mission critical services, modernize IT systems and strengthen cybersecurity defenses are also driving IT leaders’ decisions to integrate cloud options into their operations. More than 4 in 10 of respondents, for instance, expect that their agency will migrate at least some IT infrastructure to the cloud or augment existing systems with cloud services over the next two years. Concerns about the complexity of extending legacy applications to the cloud and securing them in a hybrid environment remain the biggest impediments to cloud adoption, IT officials said. Additionally, state IT leaders continue to express concern about the capability of their agencies to contract and acquire cloud services using available vehicles. Six in 10 state IT executives, for instance, said their agency has inadequate or only average acquisition capability to contract cloud services. And an equal proportion rated available contract vehicles for acquiring cloud services “difficult to use” or average at best, suggesting more must be done to update and streamline cloud acquisition practices. State IT officials, however, also reported taking a number of steps to move faster to the cloud. In particular, IT leaders are opting to replace selected applications with cloud-ready alternatives and turning to cloud providers to offer greater support with migration efforts. Download the “State Cloud Readiness Report” for detailed findings on the advancing state of cloud adoption in state civilian agencies. This article was produced by StateScoop and underwritten by VMware, Intel and Carahsoft. Read more about IT Innovation Heroes in government working to modernize the way agencies connect to their mission.